A picture speaks a thousand words … even a doctored one :). 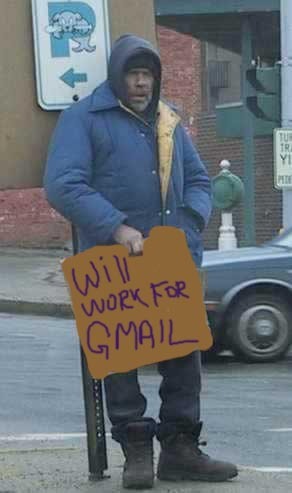 This picture no longer surprises me after reading some of the emails I’ve gotten and after reading the Gmail Community forums at Orkut. Thanks to Chris Hintz for sending that in. Also, to those of you who are still emailing me for Gmail invites and to whom I have not replied: I don’t have any more Gmail invites. When I get them, I’m likely to get just two, and I already have some friends in line. So unless I get like more than 20 invites or something somehow, I’m not going to be giving them out to random people who email me. If I do get more invites than I know what to do with, my blog readers will be the first people to know about it.